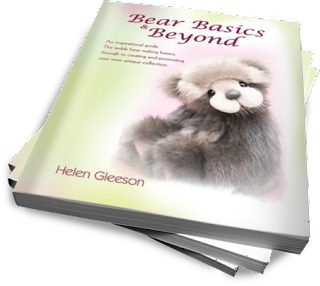 I will have a few copies of this wonderful book for sale at The Great Yorkshire Teddy Bear Event on the 20th November. This book is fantastic, not only for the beginner bear maker, but for the seasoned bear maker too. I've certainly learnt loads from it! Its beautifully produced and the pictures are perfect. My dear friend Helen of Bear Cubs Designs left the books with me after her visit to the Hugglets show back in September. I thought it would be lovely to take some along to the shows I attend so that people in the UK can have the chance to purchase a copy and not pay postage from Australia! Here's me and Helen at the Hugglets show. The day before we had spent a happy afternoon drinking coffee, eating cake and talking bears. Helen's lovely Mum and Dad joined us too. Its such a shame we live so far apart, who knows when we'll be able to do this again.